Difficulty levels in Kingdom Hearts 3 can deeply affect your playthrough. There are three KH3 difficulty settings: Beginner, Standard, and Proud. Each difficulty level carries consequences, such as how much damage you deal and how much you can take. Plus, what you choose influences what you need to do to get the game’s secret ending. With all of that in mind, here’s our Kingdom Hearts 3 Difficulty Levels – What to Choose guide to show you the differences between Beginner, Standard, and Proud, and also which stat and class to pick for playing KH3 on Proud difficulty. The difficulty level you’ll choose in your playthrough of Kingdom Hearts 3 will likely vary, depending on your experience with the franchise and your overall skill. And, you’d better choose carefully, because you can’t change the difficulty mid-playthrough. If you want to switch to a higher or lower difficulty, you’ll have to start the whole thing over. So, how exactly do the different difficulty settings in Kingdom Hearts 3 affect the game? Well, on Beginner level, you deal about 50% more damage, and receive 50% less. On Standard, you deal and can soak standard amounts of damage. Lastly, on Proud, you dish out normal damage, but enemies deal 50% more. So, that all sounds pretty standard, right? Well, things aren’t exactly all that simple. There’s one more thing; arguably; the most important one. The difficulty you choose appears to affect the criteria needed to unlock the secret ending. For example, if you play on Beginner level, you’ll have to photograph all of the Lucky Emblems, or Mickey Heads (for more info on those, check out our guides on where to find the emblems, including the Caribbean, San Fransokyo, and Toy Box, for example). The higher the difficulty you play, the less Lucky Emblems you need. We don’t know the exact numbers yet, but we’ll be sure to update you when we do. Kingdom Hearts 3 Proud Mode – What Class and Stat to Choose? 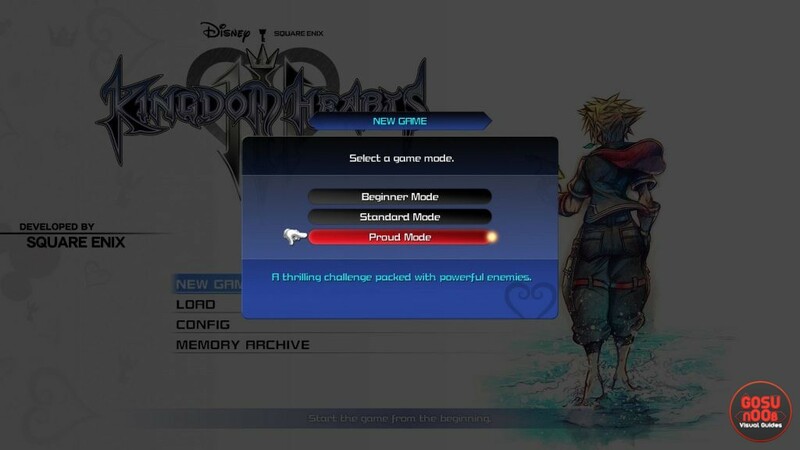 Which class and stat you choose at the beginning of Proud Mode in Kingdom Hearts 3 will, of course, depend on your preferred playstyle. If you want to learn more about classes and starting stats in the game, check out our Kingdom Hearts 3 Starting Stats & Classes – What to Choose. But, basically, what I mean is: maybe you like to brute-force through; maybe you prefer to turtle up. That said, there are two combinations that do seem better than others. First off, probably the best choice of stat is Wisdom. This is because magic is incredibly powerful, especially as you get stronger. More HP is important, but if your magic is strong, then healing isn’t much of a problem. That said, you can balance this out, which brings us to the class. For Proud Mode, Warrior or Guardian work best with Wisdom. Which one you choose, again, varies depending on how you play. Warrior is for those that want to dish out, like, all the damage, and Guardian is for the more defensively-inclined. But, again – and I can’t stress this enough – your ideal build depends on you, and only you. If nothing else, you can try out several different combos, and see what works best for your specific taste.